We live in a world that’s fast-paced and stressful. Our downtime is precious, and we don’t want to waste it on books that fail to deliver or on authors who ran out of fresh ideas several volumes ago. We want authors we can trust. New books that will once again smooth our furrowed brow and transport us to an imaginary world where we can relax and enjoy ourselves. Enter Colin Cotterill. 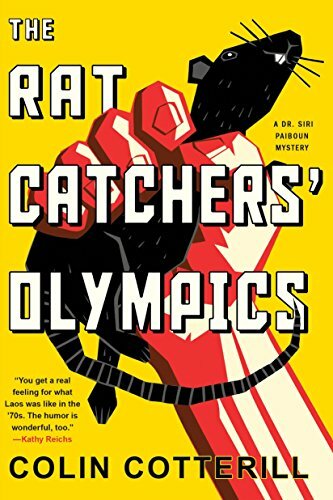 The Rat Catchers’ Olympics is the 12th in his consistently wonderful Dr. Siri Paboun mystery series, and it doesn’t disappoint. After 11 novels that follow the adventures of Dr. Siri and his cohorts in 1970s Laos, we now find ourselves off to the 1980 Olympic Games in Moscow. The boycott by the United States and other nations has provided the Democratic People’s Republic of Laos with their first chance to field a team, and Dr. Siri doesn’t miss the opportunity to horn in on the fun. Responsible for medical oversight, Dr. Siri and his wife Madame Daeng, his trusted assistant Nurse Dtui, and the rest of the crew soon find themselves wrapped up in no fewer than three murder mysteries—two in the Soviet capital and one that occurs back in Vientiane but is apparently linked to events in Moscow. Dr. Siri is not your typical amateur detective, and it’s how the mysteries are investigated that lend the series its remarkable charm. Now 75 years old, this “reluctant communist” who spent 40 years as a surgeon in the war-torn jungles of Southeast Asia only to be appointed national coroner of Laos against his wishes, has a secret ability: He communes with spirits. To be sure, Cotterill’s novels are an acquired taste. The pace of investigation is relaxed, almost leisurely. There are no fast cars chasing each other around, only bicycles and the occasional Vespa. Dr. Siri enjoys his rice whisky perhaps a little too much at times, and the crew is often distracted by less than relevant lines of inquiry. And then there’s the supernatural angle. Dr. Siri is “undeniably possessed by a thousand-year-old shaman by the name of Yeh Ming [who is] a magnet for a menagerie of ghosts that . . . passed in and out of the doctor’s life.” These ghosts are almost never directly helpful in solving Dr. Siri’s mysteries, but they often influence the direction he will take. In The Rat Catchers’ Olympics, his talents now include disappearing into a surreal dimension where he experiences an impending Aeroflot plane crash with various spirits who are trying to tell him important things. Not every reader’s cup of tea, to be sure. However, Cotterill faithfully depicts a traditional Lao belief referred to as Satsana Phi, a form of animism in which ancestral spirits protect people while malevolent spirits seek to do them harm. What’s more appropriate, then, for a 1970s Lao mystery solver than to be constantly tangled up with them? Additionally, Cotterill captures the political chaos and paranoia that gripped communist Laos during this period as the country attempted to recover from prolonged, horrific warfare. His tone is at times ironic and bittersweet, but his dry sense of humor ultimately prevails, preserving his story’s sense of whimsy. From page one to the end of the story, Colin Cotterill is an author we can trust. His Dr. Siri Paiboun mysteries transport us back to a place and time where the pace is slower and the characters are charming, witty, and definitely different. The Rat Catchers’ Olympics is perfect summer reading for all of us who desperately need a break from the stress and worry of today’s modern world and depend on the creative power of writers to deliver it to us.